I'm going to keep this review because a) I don't have that much I want to say and b) I'm still getting back into the swing of blogging. 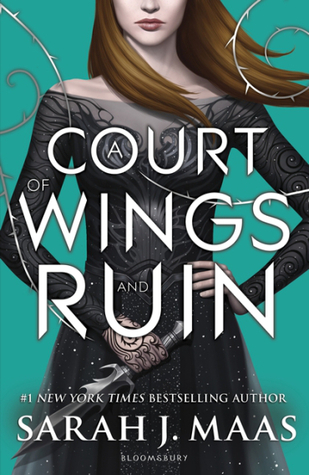 Overall, I really did like this book, but I will be the first to admit that it was not excellent, no where near the level of "A Court of Mist and Fury". Pretty sure the second book will always be my favorite in the series. That second book was just pure perfection to me. This book... I don't know, something just felt like it was lacking. It all felt rather rushed and wrapped together perfectly in a little bow by the end. The conflict was not nearly as big as I thought it would be. I think overall the plot was what was lacking for me. I did appreciate the action scenes though. Those battles were intense a.f. That being said, the characters definitely made this book. Feyre and Rhysand... my god I love them so much. Individually they are great characters, and together they are just perfection. They love each other so much and will do anything for each other and their people. I honestly don't know how I feel about the fact that this is the end of Feyre and Rhysand's stories (supposedly the rest of the series follows other characters). I've grown so attached to them, and while I do like the other characters, I don't feel like their story was fully flushed out because as I said earlier, I feel like it was rushed. Despite this, I will of course finish the series and am really interested to see who tells the rest of the stories. Almost all of the other main/close side characters, with the exception of Tamlin, grew on me and I like them a lot too, so I would be okay with reading their stories. Overall, I did really enjoy this book. I devoured it at lightning speed. The characters gave me so many feelings and I fell in love with them all over again. However, it definitely was not without it's flaws and did not live up to my expectations.